Broadband speed record holder Sigbritt Löthberg not only has the fastest broadband connection in the world, she is also the proud owner of $250,000 (£125,000) worth of hardware enabling the connection. Sigbritt is currently enjoying broadband speeds of 40Gbps after her son Peter, who has developed much of Sweden's university computer networks, hooked her up to the internet. Sigbritt Löthberg's house is now home to around $250,000 worth of hardware, and it's not exactly stuff you go down to Maplin to pick up. To achieve connection speeds like this, you need 'dark' fibre between two points to get the connection going, so existing fibre infrastructures won't work. The 40Gbps broadband connection shows that fibre in the ground to homes and buildings is the way forward. Compared to copper or cable, fibre provides much higher value in terms of the type of higher-speed internet access needed to stream high-definition TV, says The Inquirer . It also depends on which area you're in. High-speed broadband provider Verizon has said that it offers just enough bandwidth to compete with the existing cable broadband offering. This means that some regions may get 35Mbps, others may have 50Mbps, while others may get as much as 100Mbps. It all depends on how fast and aggressive the local cable company feels its speed needs to be. 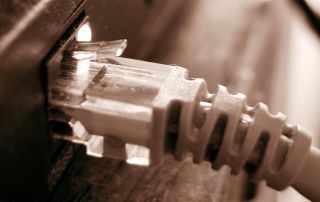 Verizon added that it is too soon to predict what kind of broadband speeds may be available to home users in the future. But speeds of 1Gbps or faster are likely, depending on the reliability of the fibre and the hardware.